Mike Bank is a great guy and I enjoyed shopping in Samurai Comics when I lived in Phoenix. Even though I didn't have a pull box and wasn't in every week, Mike recognized me and took the time to chat it up. Great businessman. Glad he took this and it's getting the attention it deserves. Incredible read. I completely believe you are right and can't wait to see it play out. Great stuff. 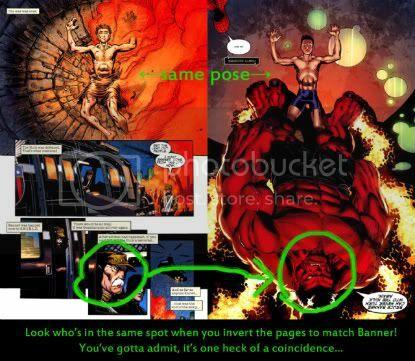 after reading HULK#14 it seems obvious. My thought was Blonsky, being it had to be someone who could handle the power, had the spy knowledge, and hated the hulk. Faking his own death is an easy way not to be a suspect, but all of the "this country" talk and Captain America was a "real hero" in the opening of issue 14 with your INDEPTH analysis is probably pointing to Ross...every issue huh? Well, you state two separate things here, steven--that he can manipulate gamma rays, but hasn't created another "Hulkish character," which is patently false. 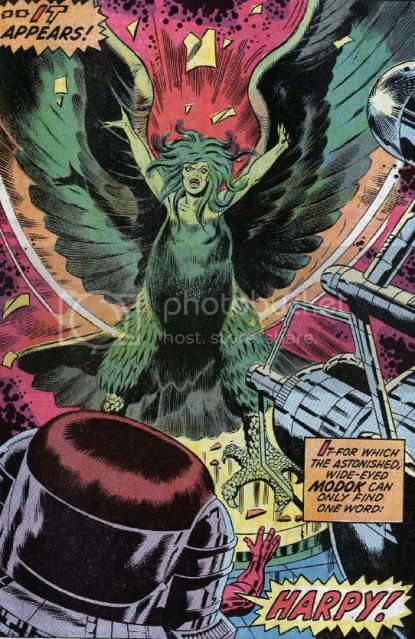 Yes, MODOK created the Harpy back in IH #168. 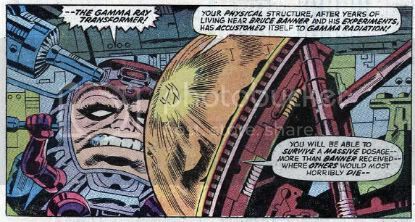 MODOK doesn't control, strictly speaking, the form the gamma mutation takes--primarily it's shaped by the subconscious of the target of gamma exposure, but in certain cases, the mutation can be based on the person off whom the energy was siphoned, and as made clear in IH #600, the red radiation that apparently begat Red Hulk hit the Banner Hulk first. 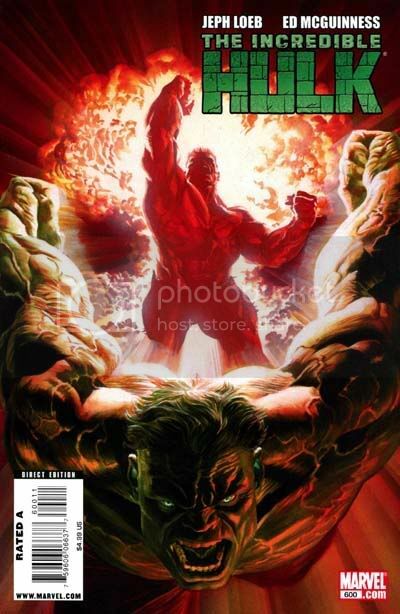 Ergo A-Bomb's monosyllabic speech, Samson's back-and-forth metamorphoses, and Red Hulk's, well, being a Hulk. 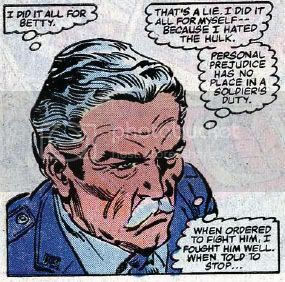 Oh, and this just in: Ryker's eliminated from contention because he's behind the new Gamma Corps Black unit per Norman Osborn, as shown in INCREDIBLE HULK #601. And the Leader...well, he's showing up in December, and it's safe to say he, too, isn't Red Hulk. Simply put, Red Hulk is someone who's appeared since Loeb's run began in HULK #1, and putting the clues together, it's Ross. In the "Code Red" story arc, Mutant assassin Domino, investigates Rulk, learning that the human form of the Red Hulk apparently has green hair. What about that? Seems to be pointing to Samson again. 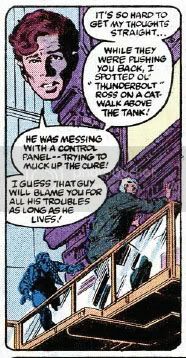 Although, Ross could have contracted green hair from the conversion process with MODOK. As far as I saw, it could very well have been Samson in the crowd with the other men in the opening pages of HULK #14. If you'll notice, the green-haired man wasn't wearing a cap; the man who changed into Red Hulk was. 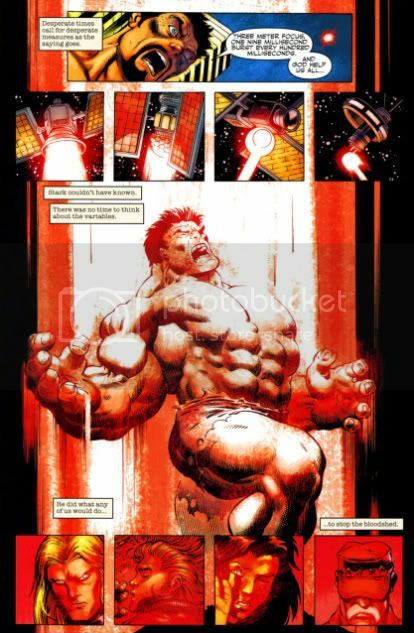 Besides, Samson was shown on-panel with Red Hulk in #600 more than once. 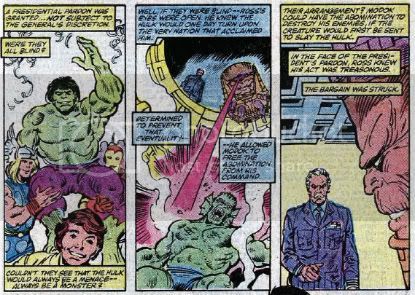 The one thing that doesn't seem to fit with the Ross being Red Hulk theory is Rulk's comments during his fight with She-Hulk. He definitely seemed to have a grudge against her and neither Ross nor Talbot would. Any thoughts? Still not convinced Rulk is Ross. Discussed Rulk with some friends aand we are convinced he is at least one of the Talbots (Brian, Matt or Glen). "Discussed Rulk with some friends and we are convinced he is at least one of the Talbots (Brian, Matt or Glen [sic])." Glenn Talbot is dead. Let his corpse rot in peace. And yes, yes--I'm aware of the images floating out there of T-bolt Ross dressed in the Redeemer armor and apparently fighting Rulk (from FALL OF HULKS: GAMMA). As someone famous once said: "This changes nothing." We still don't have a context, so it could be a dream sequence, hallucination, or LMD. When has Red Hulk made reference specifically to "Americans" and the "American government" on a continual basis? I'm finding references to "The U.S. government" (HULK #14) and that he "[hates] the Russians" (indicating he's likely not Blonsky). Show me some examples and we'll see where it goes. As it is, I'm not seeing it. Red She-hulk is be revealed as Rick Jones Former wife. 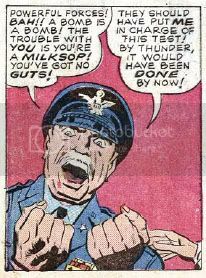 and general Ross might not be a LMD but a figment of the Red hulks mind and we see him from the Rulk's perspective. just a thought. Well, Robert, I wish I could say I agree, but it's clear you've missed some stories. Rick Jones is still married, and his wife Marlo was just revealed as the new Harpy in INCREDIBLE HULK #604. And T-bolt Ross....well, read my post on FALL OF THE HULKS: GAMMA. I really enjoy reading your commentary. I think you've pretty much been on-point about all the Hulk mysteries. Have you been reading any books involving the Sentry? 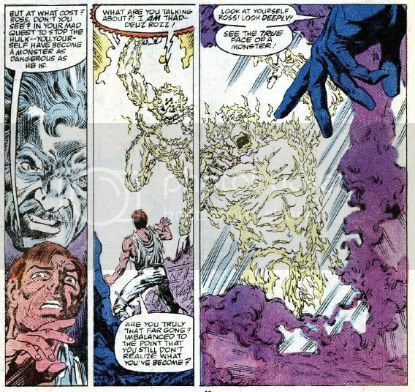 There has a rumor going around that he is really the Beyonder (which would explain the characters unevenness since he first appeared in the Marvel Universe). Would be great to hear your commentary on that.